The size of penalty is $2,000 per worker, with the first 30 workers exempted. This means that if a company employs exactly 50 workers (as could be the case with the employer profiled), then the company would have to pay a $40,000 fine. If the average pay for a worker is $10 an hour (in other words, everyone gets close to the minimum wage), this fine would add 4 percent to the company’s wage bill. If the employer currently pays for some care (as the employer profiled claimed he did), he would be able to stop paying for the care, which would offset much or all of this cost. …but don’t stop there. Who was this “one small business owner”? Thanks to the internets, and SteveM at Balloon Juice, we have an answer: Just a Humble Tradesman, Trapped in a World He Never Made. … So Joe Olivo isn’t just some random business owner—he’s dispatched by NFIB whenever there’s a need for someone to play a random small business owner on TV. Thanks, NPR and NBC —you asked us to smell the grass, and you didn’t even notice it was Astroturf. Or you noticed, but you didn’t want us to. Author JonathanPosted on 2012-06-29 2012-06-29 Categories Health Care, Media, PoliticsLeave a comment on NPR. Again. Glad about SCOTUS & ACA? Thank Louis Brandeis. A Democratic Party president’s signature legislative victory is imperiled by an aging Supreme Court stocked by Republican appointees. Tricky constitutional law obstacles, including limits on the Congress’s power under the Commerce Clause, threaten to undo a vast federal insurance program designed to solve a pressing social crisis. But then one of the justices identifies an alternative way to rescue the constitutional basis for the legislation: Congress’s tax power, he concludes, offers the basis for upholding the legislation. The scenario sounds like Chief Justice John Roberts and the Affordable Care Act known as Obamacare, which the Supreme Court upheld yesterday on the basis of the Congress’s taxing power. But it also matches perfectly the story of Justice Louis Brandeis, President Franklin Roosevelt, and the Social Security Act of 1935. And amidst all the coverage of yesterday’s decision, the crucial connection between Roberts and Brandeis has gone missing. Right out of law school, in 1979, the Chief Justice clerked for Henry Friendly, long thought of as one of the greatest judges of the twentieth century, perhaps the greatest federal judge (alongside Learned Hand) never to serve on the Supreme Court. Friendly, in turn, clerked for none other than Louis Brandeis. Brandeis’s broad view of the Congress’s taxing authority is readily apparent in Friendly’s widely respected taxation decisions. And now Brandeis’s influence is apparent in the most important opinion of Chief Justice Roberts’ tenure. Author JonathanPosted on 2012-06-29 2012-06-29 Categories Health Care, PoliticsLeave a comment on Glad about SCOTUS & ACA? Thank Louis Brandeis. Is NPR Unable to Get Access to Data on Health Care Costs? I was fairly sure when I heard this piece on NPR that Dean Baker would get around to commenting on it. Sure enough. It seems that NPR is unable to get access to data from the OECD or even the Center for Medicare and Medicaid services. If it were, it would not have so badly misinformed listeners about Medicare costs yesterday. NPR told listeners that Medicare’s costs are unsustainable and that the reason is that patients do not see the cost of their treatment. Actually, private sector health care costs have risen as rapidly on an age-adjusted basis as Medicare. Furthermore, health care costs in the United States average more than twice as much per person as costs in countries like the United Kingdom and the Netherlands where patients see a much smaller share of their costs than they do under the Medicare system. 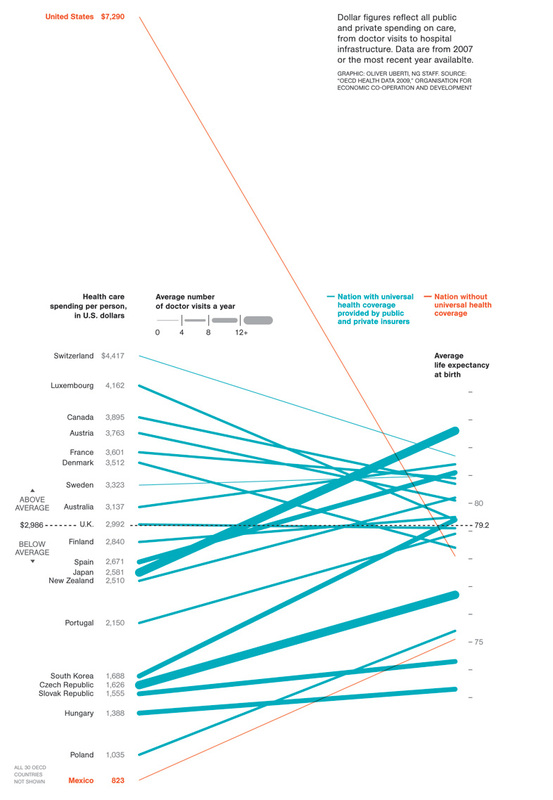 If the United States paid the same amount per person for health care as these or any other wealthy country it would be looking at huge budget surpluses in the long-term, not deficits. The article also mentioned Representative Ryan’s plan without pointing out that the Congressional Budget Office’s projections show that it would hugely raise the cost of providing care to retirees. The CBO projections imply that the Ryan plan, which was passed by the Republican-controlled House of Representatives last month, would raise the cost of buying Medicare equivalent insurance policies by $34 trillion over Medicare’s 75-year planning period. This is almost 7 times the size of the projected Social Security shortfall. In this context it is probably worth mentioning that the Republicans in Congress have targeted NPR for budget cuts. Author JonathanPosted on 2011-05-01 2011-05-01 Categories Economics, Health CareLeave a comment on Is NPR Unable to Get Access to Data on Health Care Costs? … Is the effort worth still worth it? Yes, but just. Private insurers will have to take anyone, regardless of preconditions. And some 30 million people who don’t now have health insurance will get it. But because Big Insurance, Big Pharma, and the AMA will come out way ahead, the legislation will cost taxpayers and premium-payers far more than it would otherwise. Cost controls are inadequate; in fact, they barely exist. If Wall Street’s top brass are “fat cats,” as the President described them last weekend, the top brass of Big Insurance, Big Pharma, and the AMA are even fatter. While they don’t earn as much, they’re squeezing the public for even more. We are slouching toward health-care reform that’s better than nothing but far worse than we had imagined it would be. Even those of us who have seen legislative sausage-making up close, even those of us who never make the perfect the enemy of the better, are concerned. That two or three senators are able to extort as much as they have is appalling. Why hasn’t Reid forced much of the bill into reconciliation, requiring only 51 votes? Why has the President been so cowed? In all likelihood, the White House and the Dems eventually will get a bill they can call “reform,” but they will not be able to say with straight faces that the reform is a significant improvement over the terrible system we already have. It’s why you come to Pragmatos, after all, and we don’t disappoint. We’re relatively ignorant on the subject, but we do know who to ask, and in case you don’t, we’re glad to be of service. Go to Breast Cancer Action, who for a variety of reasons are the go-to folks on these questions. Mammography screening is in the news again. The US Prevention Services Task Force has announced new guidelines for breast cancer screening that would mean women get fewer mammograms. This is good news. Read BCA’s analysis of the new recommendations here. On the issue of prevention, click here for information on why words matter. Bonus: the Washington Post makes a useful point relating this bit of news to health care generally. The reversal of the seven-year-old guidelines, and the resulting uproar, demonstrate why reducing medical costs will be challenging even with a well-designed health-care reform bill. Ideally, medical practice should follow the evidence. When drugs or procedures are proven to do more harm than good, or to do no more good than safer or less costly alternatives, incentives should be used to discourage them. In practice, though, as new studies overtake old research and new advice contradicts previous guidelines, the result can be confusion and even cynicism — and political pressure to ignore the results. Late update: Sarah Palin says it’s death panels! Health care reform is extremely likely to pass in some form. But let’s not kid ourselves that it’s passing because the Democrats and the public have seen the light and understand that we need to be a more decent society. It’s passing because medical industry has been greedy to the point where it’s now unsustainable. That presented an opening for liberals to enact some policies they have believed in for a long time. But they didn’t do it by making the liberal arguments straight up and have created some kind of strange hybrid system for which the best argument is that it might lead to opportunities for more reform. It’s better than nothing. But it isn’t liberal and it wasn’t designed to be. And just in case, the powers-that-be stuck it to the pro-choicers to make sure nobody got the idea that it was. Technology distances doctors from patients. It creates a compelling alternative reality composed of facts that may or may not be accurate (note all the false alarms created by spurious X-ray findings and aberrant blood tests). It incites considerable public backlash (shortly after X-rays were developed, stores in London were selling X-ray-proof underwear to preserve genital privacy). Then wild enthusiasm takes over (as exemplified by those X-ray shoe-sizing machines of the 1940s). Medical professionals tend to be the opposite: first enthusiastic and then less so, as the limitations and drawbacks of the toys become clear. At a 1960 medical conference unveiling a new Teflon shunt for long-term kidney dialysis, the audience of doctors and scientists actually rose and cheered. But soon enough they were faced with the painful task of allocating what proved to be an extremely limited resource. In Seattle, the job of deciding who would live on dialysis and who would die of kidney failure fell to a seven-member committee of laypeople dubbed, in a 1962 article in Life magazine, “the life-or-death committee.” Sound familiar? Only after the 1972 decision to extend Medicare to dialysis patients were these decisions no longer necessary. Health care reform: who’s your daddy? This piece by Robert Reich lays out the worst problems with the current health care legislation. He’s right, of course, but it seems to me a safe assumption that the administration will cave on whatever they need to in order to pass a bill and claim victory. I could be wrong, of course—maybe Obama’s tough talk will turn out to be more than just talk. I doubt it. Last January, as I understand it, the White House promised Big Pharma, big insurance, and the American Medical Association the moral equivalent of what Joel Halderman allegedly demanded of David Letterman: hush money. The groups agreed to stay silent or even be supportive of healthcare reform, as long as they were paid off. But now that it’s time to collect, the bill is larger than the White House expected, and it’s going to fall like an avalanche on middle class Americans in coming years. That means an ugly 2012 election (read Sarah Palin). So the President has to do what Letterman did: Refuse to pay. Big Pharma is on the road to getting its deal: not only 25 to 30 million more paying customers, but also a continued ban on Medicare using its bargaining clout to reduce drug prices, a bar on genetic drug manufacturers introducing similar biologic drugs until the originals have been on the market at least twelve years, and no public insurance option to negotiate low drug prices. Big insurance is on the way to getting what it wants: 25 to 30 million more paying customers (many of them young and healthy), a requirement that almost all businesses “pay or play,” and no competition from a public option. Doctors (that is, the American Medical Association) are on the way to getting what they want: Instead of a temporary patch on scheduled decreases in Medicare reimbursements to them, a permanent fix that would change the reimbursement formula altogether and reward them $240 billion over the next ten years. But when they all get paid off, who will do the paying? Middle-class Americans who are already in a financial squeeze — whose wages are lower, adjusted for inflation, than they were thirty years ago, and whose jobs are disappearing. They’ll face still higher premiums, co-payments, and deductibles; and they’ll pay higher drug prices, Medicare premiums, and taxes to cover the rest. That’s because these payoffs make it next to impossible to contain the wildly escalating costs of health care. The only thing in the emerging bills that’s related to cost containment is a proposed excise tax on so-called “Cadillac” insurance plans, costing over a certain threshold amount (the threshold is now up for grabs). But because the costs of health care are likely to rise faster than inflation, whatever threshold, the middle class will get socked again. So Obama has to forcefully weigh in with Nancy Pelosi and Harry Reid as the two try to cobble together passable bills for each chamber — demanding real cost containment. The three big ones: (1) A true public option (better yet, one that allows anyone now holding private insurance to opt into). (2) Authority for Medicare to negotiate low drug prices. And (3) Lower Medicare reimbursement rates to doctors (in other words, no “doctor fix”). In addition, the so-called “medical exchanges” in the emerging bills (as well as the public option, which hopefully will be included) should give preference to pre-paid heathcare plans, like Kaiser Permanente, whose doctors are on salary and have every incentive to keep people healthy rather than charge for more services and tests. But if Obama doesn’t weigh in and say “no” to the hush money for Big Pharma, big insurance, and the AMA, America’s middle class will get walloped. And if the walloping starts before 2012, Sarah Palin or some other right-wingnut populist will wallop Obama, and then will wallop America. Author JonathanPosted on 2009-10-18 2009-10-18 Categories Health Care1 Comment on Health care reform: who’s your daddy? A little weekend reading. Yves Smith points us to a piece by Jerome Groopman in the NYRB. A fascinating and somewhat disturbing article at the New York Review of Books by Jerome Groopman looks at what counts for progress in medical diagnosis and finds it to be more of a mixed bag than most readers would assume. This won’t come as much of a surprise to those who know a bit about the field (one of my colleagues who worked at the National Institutes of Health called it “a medieval art”). But what is a tad disconcerting is that the efforts to make medicine more scientific may not in fact be a plus. That may sound simply bizarre to readers. Isn’t evidence based medicine a good thing? Well, maybe not. One of the reasons this piece struck a chord with me is that some of the efforts to make medicine more scientific parallel, in their negative aspects, the push to make economics more scientific. In medicine, this means developing more rules and tools for diagnosis; in economics, the course chosen was to impose more “rigor” which meant make greater use of mathematical exposition (proof-like theoretical papers) and to have “empirical” papers centered around statistical analysis of data sets. Now while this all may sound well and good, in fact, both are methodological choices that limit investigation. For instance, evidence based medicine seeks to gather symptoms and then use that to determine what the ailment might be. Well, the problem is these protocols have been developed from people with only one thing wrong with them. Many people who show up in doctor’s offices have multiple pathologies. So a lot of effort is being expended to develop an approach that has limited value in the field, and worse, doctors are increasingly expected to conform to it. After reviewing thousands of patient records, medical researchers have estimated that only 2 to 3 percent of cases of medical negligence lead to a malpractice claim. So the most promising fixes are the ones that don’t treat the malpractice system as an isolated issue. Imagine if the government paid for more research into which treatments really do make people healthier — a step many doctors don’t like. Such evidence-based medicine could then get the benefit of the doubt in court. The research would also make it easier to set up “health courts,” with expedited case schedules and expert judges, which many doctors advocate. Similarly, you would want to see more serious efforts to reduce medical error and tougher discipline for doctors who made repeated errors — in exchange for a less confrontational, less costly process for those doctors who, like all of us, sometimes make mistakes. A grand compromise along these lines may be unlikely. But it’s a lot more consistent with the evidence than narrower ideas. The goal, remember, isn’t just to reduce malpractice lawsuits. It’s also to reduce malpractice. Ezra Klein. All this while leaving tens of millions uncovered. Is your boss going to shell out $30K/year for your health insurance? You sure about that? The Kaiser Family Foundation’s latest Employer Benefits Survey is out, and they’ve got some numbers worth remembering. The average cost of a family health insurance policy in 2009 was $13,375. Over the past ten years, premiums have increased by 131 percent, while wages have grown 38 percent and inflation has grown 28 percent. If health-care costs grow as fast as they have over the past five years, the average premium for a family policy in 2019 will be $24,180. If they grow as fast as they have over the past 10 years, premiums in 2019 will average $30,803. No one quite knows when, or how, the system will crumble. But make no mistake. At this rate of increase, it will, eventually, crumble. Want more numbers? They’re here. T.R., not Harry (and what does T. R. stand for? surprisingly hard to find out). Reid was on KQED’s Forum yesterday, on tour for his new book, The Healing of America: A Global Quest for Better, Cheaper and Fairer Health Care. The book came out of his reporting for the Frontline production Sick Around the World, which I’ve recommended before (and still do). Reid visited a longish list of developed countries, looking at how they manage their health care. His viewpoint is refreshing free of wonkiness, though he does have a good grasp of the facts and issues. The fundamental first step, Reid asserts, is to make the moral choice of providing universal health care, and then work out the details. It would sound hopelessly naive were it not for the fact that every developed country in the world except for the US has managed to accomplish it, with lower costs and better outcomes. Go to the Forum page or iTunes for the interview; it’s worth your time. I have a small collection of pending posts that make this point: many, maybe most, Americans with health insurance have no idea how shaky their coverage will be when they really need it. This one is from Andrew Koppelman. Seventy-three percent describe the affordability of basic medical care for themselves and their families as “manageable” or even “easy”; 69 percent say that their health insurance company pays for all or most of the treatments and medicines they current need; and fully 76 percent say they are very or somewhat confident that if they were to become seriously injured or ill, their insurance would pay for everything they needed to get better. According to the Kaiser Family Foundation, the share of Americans who believe that they or their families would be worse off under reform has risen by 20 percentage points since February. Today, fully 51 percent are more worried about the health reform bill they expect Congress to pass than by the possibility that reform will be delayed beyond this year. Kaiser Health News has posted Nixon’s 1974 plan for universal health care. What a commie. Comprehensive health insurance is an idea whose time has come in America. There has long been a need to assure every American financial access to high quality health care. As medical costs go up, that need grows more pressing. Now, for the first time, we have not just the need but the will to get this job done. There is widespread support in the Congress and in the Nation for some form of comprehensive health insurance. Surely if we have the will, 1974 should also be the year that we find the way. I was going to point to the Reid piece, but DougJ did the work for me. Reid, you may recall, reported the excellent Frontline documentary Sick Around the World, which you should watch if you have not already. Via Kevin Drum, this editorial in Investor’s Business Daily. Hawking is, of course, British. He lives and teaches in Cambridge (UK, not MA). And that’s not the silliest part of the editorial. Have a look if you’ve got nothing better to do and see how Obama is going to kill your grandma. Update 2: IBD has edited the Hawking mention out of the editorial. Yesterday, I explained that it is ludicrous to argue that the NHS never gives quality care and that Prof. Hawking is a good example of when it does give world-class care. However, the mere fact that he received such care does not mean that the NHS is perfect. No doubt that will come as a surprise to all those who have been insisting that the NHS is, in fact, perfect. Via Dean Baker, who had two good things to say about Washington Post articles today. Surely the Second Coming is at hand. In August 2005, doctors at Urological Associates, a medical practice on the Iowa-Illinois border, ordered nine CT scans for patients covered by Wellmark Blue Cross and Blue Shield insurance. In September that year, they ordered eight. But then the numbers rose steeply. The urologists ordered 35 scans in October, 41 in November and 55 in December. Within seven months, they were ordering scans at a rate that had climbed more than 700 percent. The increase came in the months after the urologists bought their own CT scanner, according to documents obtained by The Washington Post. Instead of referring patients to radiologists, the doctors started conducting their own imaging — and drawing insurance reimbursements for each of those patients. In focusing on health-care reform this year, President Obama pledged that a revamped system would hold down exploding costs. But none of the players — Congress, the administration or the array of interests involved in the process — has offered a clear path to that goal. And efforts to control medical practices that have driven up expenses, including physician “self-referrals,” underscore how difficult it is to alter entrenched patterns. A host of studies and reports by academics and the federal government shows that physicians who own scanners order many more scans than those who do not. As a result, Americans pay billions of dollars in extra taxes and insurance premiums. Government panels have found that, across several areas of medicine, ordering more procedures does not improve health outcomes. In the case of medical scans, unnecessary imaging also creates a health risk — as many as 1 percent of all cancers in the United States appear to be caused by radiation from medical imaging, according to Amy Berrington de Gonzalez, a radiation epidemiologist at the National Cancer Institute.